The Seward Park Urban Renewal Area (SPURA) on the Lower East Side is the largest undeveloped city-owned parcel of land south of 96th Street. As the community effort to revitalize the space heats up, students in Eugene Lang College The New School for Liberal Arts’ City Studio course present the exhibition (Re) Visiting SPURA. On view April 7-May 20 at the Abrons Art Center at 466 Grand Street, the exhibition presents the complexities of the SPURA site through an exploration of its history, current conditions, and the many visions for its development in the future. For the past three years, Gabrielle Bendiner-Viani has taught the City Studio course as part of the university’s Urban Studies curriculum. The course challenges students to understand histories of housing in New York City, theories of urban development and community participation, and asks them to engage in archival, ethnographic, visual and participatory research. 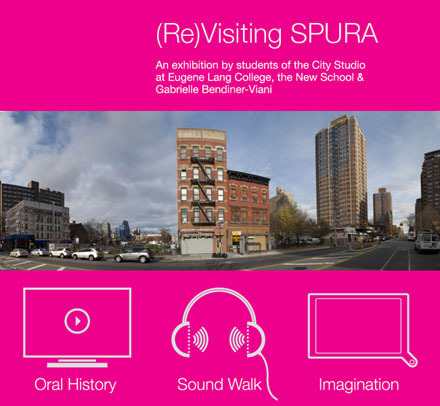 For this project, the students developed careful and creative methods for researching SPURA. The exhibition is meant to spread the word about the research to the community, and encourage further participation.